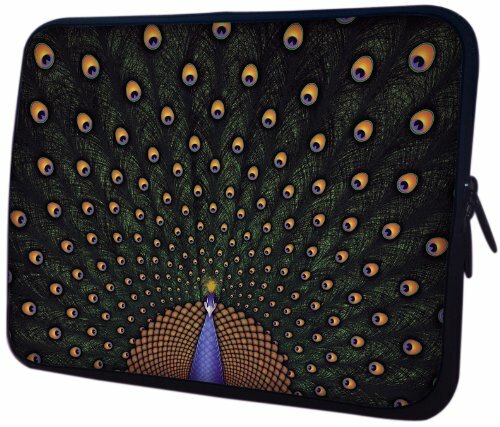 The cushioned, laptop computer pouch case with fascinating Peacock design, provides as much protection as it does style. The “eyes” are best seen when peacock fans its tail. Its plumage has iridescent purple, orange and green colored to attract your attention. Let the stylish peacock pattern attract the crowd for you. Made from neoprene, which is a tough, flexible, synthetic rubber that is water-resistant, and helps protecting against bumps and dings. In addition the soft interior lining prevents from scratches. Dual two-way zippers offer quick and easy access. It’s lightweight and slim fit slipcase design can easily slip into a messenger bag, briefcase or backpack. If you’re looking for a laptop computer bag to do the work of protecting your notebook while still being fashionable and stylish, this is the notebook carrying case for you. * Due to monitor variations colors may appear slightly different. Form fitting neoprene material stretches to accommodate most netbook with up to 14 inch display. 2-way dual zippers closing for easy access.